Does anyone else have the problem of your photos loading sideways when listing? I’ve been having this problem on and off for a few months now and I think I’ve finally figured it out. After a lot of googling and reading computer stuff that’s waaay too technical for me, I’ve learned that it has to do with embedded orientation tags. I’ve played with various cameras, iPads, iPhones, etc. 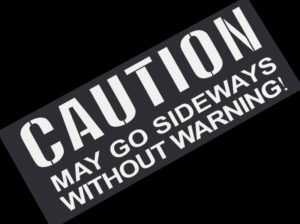 and was still having to rotate pics when I uploaded them to my eBay listings….slow and tedious and very frustrating! Turns out that all photos are encoded vertically….even if you take them horizontally. Who knew!? 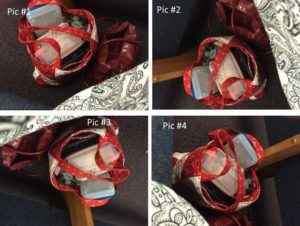 The photo software on your computer may flag your picture so it displays it as a rotated image, but eBay doesn’t read that flag, so eBay displays the photos the way the data was originally encoded. Frustrating and time consuming to edit during listing. You can edit the photos using eBay’s rotation tool, or you can do what I did last night, find a true image editor to rewrite all the image data before you upload to eBay. One post suggested downloading the free software Irfanview, so that’s what I did. There are a lot of settings you can select or deselect when saving an image; I just made sure “Reset EXIF Orientation tag” was selected and I saved all my existing pics with this setting and uploaded with no problem. Then I wanted to figure out the correct orientation on my phone so I could take pics without going through the editing process (since I THOUGHT when I took the last batch of pics that holding my phone the way I was holding it would get me photos with the correct orientation, but didn’t). Sooo, while sitting in church last week waiting for the service to start, I held my iPhone 6 in the horizontal position with the round home button on the right and the volume buttons on the bottom and took the first pic (which is the correct orientation), then I rotated the phone vertically with the home button on the bottom and took pic #2, rotated with home button on the left for pic #3 and rotated with home button on the top for pic #4. When I got home I uploaded the pics on my computer and then to a mock listing and Pic #1, in horizontal position with home button on the right wins! I’ll be taking the next batch of pics holding my camera this way and will be all set! This has been beyond frustrating for me to figure out and I was so happy when I did last night. I hope by sharing what I learned you’ll avoid some frustration and be able to get your listings done faster! 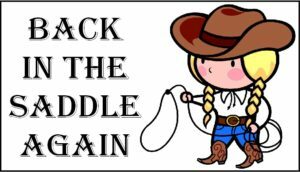 I’m back in the saddle again and listing like crazy. I think I’ve finally hit my eBay and listing stride! I had a great weekend of fun but was also able to get a great deal of work done and I’m happy to report I have officially listed some personal stuff from my house! It’s been hard to get to it because I had these piles of other things that seemed to get in the way. I did get some larger items listed in hopes of selling them off quickly and getting them out of the way and that worked. Then I had a basket full of lip balm that I sourced after Christmas that I wanted to get sorted and listed. Then there was that basket of shorts and summer tees staring at me every day and well, you get the picture! I managed to get a bunch of that “have to do” stuff done and I was actually able to get the decor pieces from my laundry room listed…yeah me! 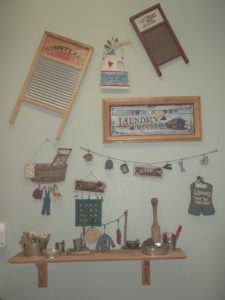 This is what my laundry room looked like and while it was fun to collect the pieces and put it together over the years, when I packed it all away to move I just saw dollar signs. I decided to create a new store category “Laundry Room” just to keep all the decor together and organized and that seemed to work well. I’ll probably do that for some of the other rooms and collections as I prepare to list them. Click on the “laundry Room” link above to see all the fun stuff I managed to get listed. But that wasn’t all…I was on a mission and that mission ended with 106 new listings! I hate, hate, hate listing clothes! I hate taking pictures, measuring, describing, just all of it. But the problem with that mentality is that clothes are such a great revenue source that it’s hard NOT to list and sell them. So when I stumbled onto a bunch of Danskin athletic shorts for $1-$3 I scooped them up and bought about 100 pairs. And guess what….I got those photographed and listed this weekend too..YEAH ME AGAIN! But I didn’t stop there…I was on a roll. I had a few things I was selling for some girls I know and I wanted to get them listed, off my desk, and put into inventory. I also had a box full of these same items that I sourced off a local Facebook group and another bag a friend had given me after Christmas. 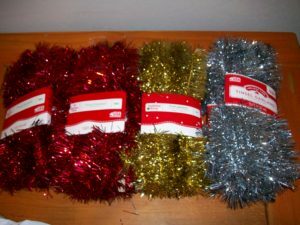 These are long tail items that are quick and easy to list and I wanted to get them photographed, listed and out of the way. You’ll never guess what I was so anxious to get listed….EMPTY American Girl Boxes. Yup, you read that right! 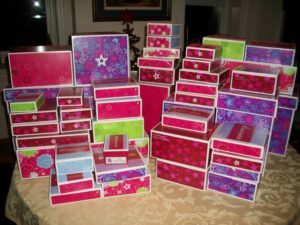 I’ve been selling the boxes that my niece’s American Girl dolls, clothes, accessories, furniture, etc. come in and they have been raking in the bucks! I’ve got two nieces that were into American Girl dolls from the time they were five until they were about 13 or 14….and they have quite the collection of American Girl stuff. I’m not sure when or why I started listing these boxes, but I’m sure it started on a whim, one of those “let’s list it and see if it sells” experiments. Well they did sell and my older niece made over $1,000 selling her empty boxes over the years! She earned that much money selling TRASH! How crazy is that!? My AG Empty Box inventory was waaay down and I manged to take pictures and post most of the ones I have to list, but I’m not done yet…that’s the first thing on the ‘to do’ list in the morning. I estimate I’ve got about 60 more to get listed and it is my goal to get them all done tomorrow…wish me luck! I picked up 15 of these for $10 at our community garage sale about two years ago. I priced them high because I knew they would be HTF new in package. I think I sold the first few at $79.99 then dropped the price to $44.99 and sold a few more. Pushed the price back up to $54.99 and have sold all but two. This weekends sale is to a new eBay buyer. I LOVE when a newbie finds my stuff and buys it. That tells me my keywords are working. Who else remembers these from the 90’s? 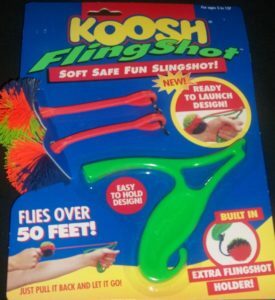 We had Koosh ball wars at the office. If you remember and want one, click here before they’re gone! 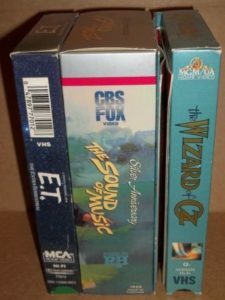 VHS is not dead, I think it’s actually picking up. I posted a bunch of movies when I cleaned out my office to move. This is about the third of fourth set of movies I’ve sold. Not a ton of money, but money none-the-less. A little time and effort and some cash in my pocket versus dumping in a box and dropping off at a thrift store. This one is another LiFi (List It and Forget It) successful sale. I bought these at a Savers in Las Vegas for $9 in 2014. I listed them February 6, 2014 and priced them HIGH. This sales model isn’t for everyone, but the way I look at it 98% my work is done when I list the item. I can price it at $50 and sell in a month or two or price it at $150 and sell in two years. Keep in mind that in the past few months I’ve put my clothing items on sale for 50% off at least 5 times and these didn’t sell. I point that out just to show that price isn’t the only factor in selling an item…especially shoes. 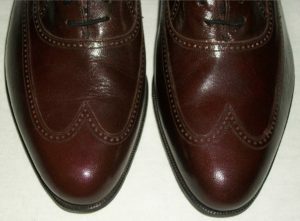 I needed to wait for someone to come along that was a size 11, wanted this style of shoe, in this color and was willing to pay the price. Had he been looking any number of times the past few months, he would’ve gotten them for a 50% discount. Better yet, the buyer is happy as can be and left fabulous feedback. Everyone wins! Another great LiFi sale…this one only took about 10 months. This is a pair of Osh Kosh overalls I bought for myself when I thought it would be cute to match my then 4 year old niece who is now 23. I haven’t worn them in years and put them up last August for $60. You may think that $60 is too much to pay for a pair of used and altered overalls, but I didn’t. 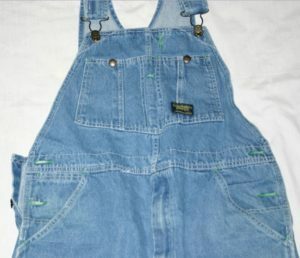 They are overalls and hard to find. I saw the value in them, especially since they were adult Osh Kosh and priced them accordingly. Waiting 10 months for something to sell, especially clothing, is no time at all. Price you items as though they have value and be patient for the right person to come along. It WILL happen! Here’s another good example of LiFi…listing something and waiting for the right buyer to come along. I purchased this Live at the Roxy ashtray for $2 on a thrifting trip with Jason T Smith in 2014. I grew up in Southern CA and have never been to the Roxy, but I recognized the logo. Jason has been to more concerts than all my friends combined and he wasn’t sure of the logo when I found it so we had to do a quick internet search to make sure. 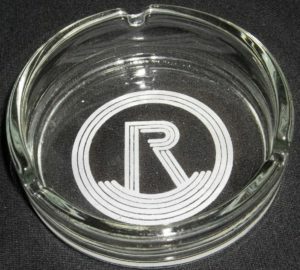 I listed it Aug 15, 2014 and it sold this month….$50 for a flippin’ ash tray! Small item, not taking up any space in my inventory area, priced it high, let it ride and today was pay day!